Details have emerged of footage filmed by Paris gunman Amedy Coulibaly during a bloody rampage inside a Jewish supermarket, a French website says. He delivers an anti-Semitic rant and shouts "Stand up or I'll kill you" at hostages, according to a transcript obtained by Le Nouvel Observateur. During the seven-minute video he shoots dead three of his four victims. Seventeen people died in three days of violence that began at the offices of Charlie Hebdo magazine on 7 January. Brothers Cherif and Said Kouachi killed 12 when they burst into the satirical magazine's offices. Police believe Coulibaly shot dead a policewoman in the Montrouge area of the French capital the day before the attack on the kosher supermarket at Porte de Vincennes. Investigators are examining seven minutes 45 seconds of footage apparently filmed by Coulibaly on a GoPro camera worn during the siege, according to reports. It shows him shouting "Nobody move", before grabbing hold of a customer, asking his name, and then shooting him dead. He asks another man what origin he is. And when the hostage replies "Jewish", he kills him too. "So you know why I am here then. Allahu Akbar," he shouts, according to Le Nouvel Observateur's report. He is also heard making anti-Semitic remarks when one woman tries to tell him that his hostages have done nothing wrong. Coulibaly is believed to have had a long history of criminal activity - including drugs offences - and links to at least one of the Kouachi brothers. 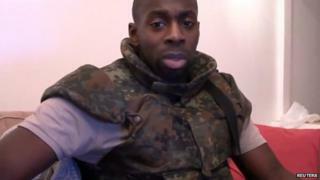 A separate video that emerged after he was shot dead by police apparently showed him pledging his allegiance to the Islamic State militant group, and claiming the attacks were "retribution". The supermarket footage, which the BBC has not been able to verify, apparently shows him asking one of his hostages to help upload his camera footage to a computer. Shop assistant Lassana Bathily is thought to have saved many customers' lives by hiding them in a cold store. The transcript comes a day after France announced plans to improve dialogue with the country's Muslim community. The proposals, which are partly aimed at tackling extremism, include further consultations with Muslim leaders, and doubling double the number of university courses for imams to ensure their training is "faithful to the values of the Republic".